Vogel was convinced by Johnson's arguments and it was decided to establish a Navajo code programme at Camp Pendleton at Oceanside, California. In May 1942 the first 29 Navajo Code Talkers were recruited. Over the next few months more than 450 frequently used military terms were given Navajo equivalents. For example, dah-he-tih-hi was the Navajo word for hummingbird. In the code dah-he-tih-hi now became the word for fighter plane. Whereas toh-at (between waters) meant Britain. 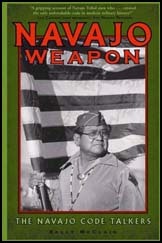 An estimated 400 Navajos agents were trained to use the code and around 300 saw action in the field. Speaking Navajo and using an additional code within that, they were able to convey information and orders among Marine units and Navy warships and aircraft. The Code Talkers served in all six Marine divisions, Marine Raider battalions and Marine parachute units. The Code Talkers were a part of every major Marine assault during the Second World War and first saw action on 7th August 1942 when the marines landed on Guadalcanal. Merril Sandoval and several other Navajos who was sent with the marines that invaded Japanese held Iwo Jima on 19th February, 1945. The Navajo Code Talkers were distributed among the 3rd, 4th and 5th Marine divisions. Sandoval's job was to stay behind the frontline and translate reports from two-man code talker teams elsewhere on the island. Sandoval then sent back these messages to military commanders based on Hawaii. Sandoval was also responsible for passing on orders to the U.S. Marines on the frontline. Some senior officers believe that the contribution of the Navajo code played an important role in the success of the operation as the Japanese had already broken the codes of the United States Army and the United States Air Force. Major Howard Connor, a 5th Marine Division signals officer, later argued: "Were it not for the Navajos, the marines would never have taken Iwo Jima." Being a Navajo Code Talker was a dangerous occupation. According to Merril Sandoval, Navajo soldiers were at great risk from being shot in battle by their own side: "Those city kids had no idea. On the frontline, some of them mistook us for Japanese." Sandoval and his team of code talkers fought throughout the Pacific campaign and were with the U.S. Marines when they arrived in Japan in September 1945. The role of the Navajo code breakers was kept a secret until 1968. It was claimed that the main reason for this was that the military might want to use the code again after the war. Another factor might have been because the government had for many years been involved in trying to destroy the Navajo language. For example, during the Second World War, while the Code Talkers were risking their lives on the frontline, back home, Navajo children were being punished at reservation schools for speaking their native language. In December 1981 President Ronald Reagan awarded the Navajo Code Talkers with a Certificate of Appreciation. A campaign led by Senator Jeff Bingaman led to the first 29 Code Breakers receiving Congressional Gold Medals in 2001 and the rest received Silver Medals. A Hollywood film based on the role of the Navajo code talkers, Windtalkers, appeared in 2002. 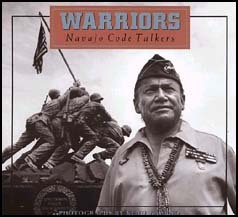 The original 29 Navajo Code Talkers were recruited early in 1942 in response to the growing problem of Japanese interception of radio transmissions, which meant codes were becoming increasingly elaborate and taking longer to decipher. This was not the first time native Americans had been used to pass military information in battle: a group of eight Choctaw were used to transmit messages during the closing stages of the first world war. But it was the first time such a language had been used to create a code. The result was so baffling that, after three years of trying, the Japanese never broke it. The idea belonged to Philip Johnston, a missionary's son, who had been brought up on a Navajo reservation and spoke the language, called Diné, fluently. Diné had the advantages of being naturally complex and virtually unwritten: the first, incomplete Diné alphabet was developed in the early 20th century. Meaning in the language is not only dependent on accurate pronunciation: the tonal emphasis can totally change the sense of a word - "doc", for example, is either "and" or "not" depending on your tone. But the final defeating challenge must be the "ejective" consonants, expressed with a burst of breath. Young Navajo men who were already trained as Code Talkers came to the school and talked to all the 18-year-old boys. They wanted boys who were in good physical condition, who could speak and write English and speak Navajo fluently. It took us about two months to learn the code. Then we were shipped to New Zealand, and from there to Guadalcanal, after it was secure, where we were trained for the jungle. At first there were quite a few generals and commanders who didn't think it was going to work. So they set up two communications centres, one run by white signalmen. They gave us both 10 messages to send and decipher. Theirs took almost five minutes to cypher and decode, ours took one to two minutes. Sometimes we worked off the beach; then they sent us back and forth from the command ship to the front line. We were working almost day and night. Looking back, I don't think I was even scared. When you are young you don't think much about what's going to happen. "Kill or be killed', that's what the training had instilled in us. I was just thinking it was like a film. The landing was terrible. The surf was really rough and the beach was steep, so when the landing craft didn't hit straight on they turned over. In the end we had to dump all our gear, including the radios, and swim ashore or we would have drowned. One incident in particular I remember distinctly. We encountered a force that was superior in manpower and firepower, and so we were pinned down for a couple of days at least. That was the time the antenna on my radio was shot off. We were trained in a number of areas of communication, and one of those was field wire, so we'd always have some field wire with us and the tools to work with it, like pliers and cutters and stuff like that. So I was fortunate enough to put that back together. At least for a temporary fix to get a message out. So we got a message out for an air strike. And they showed up in just a little while and saved the day. That was on Okinawa. When I ran across that Death Valley, I ran into a whole bunch of Marines who got shot down trying to cross that valley. Some were still alive, and they reached out to us to ask for help. But the sergeant was right behind us and said, "You're not supposed to do that kind of duty, you're supposed to locate the machine-gun nests and report back. That is your mission." So we didn't have time to help anybody out, we just kept going and we located a couple of them (enemy positions). Just to keep the machine guns silent, we threw some hand grenades close by the machine-gun nest. And we found out it's not an open nest, it's an enclosed nest, and there's just a slit where they were firing from. Even though we hit the enclosed nest, the hand grenade bounced off and exploded outside. But then that was just to keep their heads down until we crossed back across the valley and report, and we did report, and that's when one of the Navajo Code Talkers sent a message and ordered artillery fire, mortar fire and rockets. While he was sending over there, and I was over on the other side, the sergeant chewed me out. Oh, he really got after two of us who stopped and tried to help those wounded Marines. And when they finished sending the message, within about five minutes, they started shelling and (dropping) all that bombardment on that machine-gun area, they just literally blew everything up. I don't know how many minutes it took them. When they stopped firing, they ordered the Marines to cross it, and the Marines just walked across that valley. So those machine guns were all knocked out. That was toward the end of the Iwo Jima operation." I raised my hand and swore to protect the flag, the constitution and my country. But after the war, having fought and been injured, I came back and found we Navajos were still being pushed around. I worked seven years in a uranium factory. It was the only job I could get.